Shake in an iced cocktail shaker. Strain into a large cocktail glass, rim crusted with salt. Since this recipe is from the appendix of Dr. Cocktail’s book, there are just recipes and almost no exposition, so I can’t add much to the history. 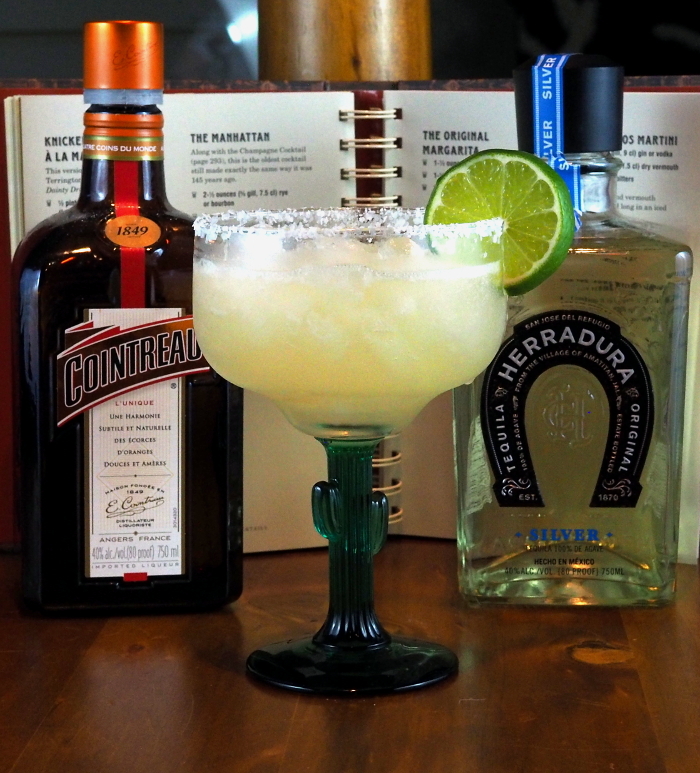 This recipe is presented as the “original” Margarita and it is backed up by Wikipedia, which states it was invented in Mexico in October of 1941 and consisted of equal parts tequila, orange liqueur and lime, and was served with a salted rim. The idea of using sugar or salt on the rim of a cocktail glass goes all the way back to the Brandy Crusta. Rim half of a double rocks glass with salt. Shake all the ingredients with the ice, then strain into the rimmed glass over ice cubes. Garnish with a lime wedge. This first Margarita I made for this post was using the Doctor’s recipe. It was nice, but a tad too sour. For Andrea’s I added the agave nectar. Not only did it improve the drink, I liked the fact that both the nectar and the tequila come from the agave plant. I added a dash of nectar to mine as well. I also served it over ice. Although I think it would work neat, I’ve always liked my Margaritas on the rocks. Or frozen. While I wouldn’t ask for one now, a common method of serving Margaritas is blended with ice. I think it dilutes the drink too much, although I do remember a time my friends Nick, Nora and I spent the better part of a day at a Chi-Chi’s Restaurant “drinking a rainbow”. This was a series of seven pitchers of Margaritas, each a different color. We had the flavors strawberry, mango, top shelf (aged tequila), lime, Midori, Blue Curaçao, and raspberry. We were trying as closely as possible to match the “ROY G. BIV” of the color spectrum (yes, we’re geeks). Needless to say, those drinks had little in common with the Original Margarita. Notes: Tequila comes in three main varieties: blanco, repasado and anejo. Blanco, or “white” is unaged, and is considered by some to be the purist form of tequila. For this drink I went in search of a good blanco option, as the spirits recommended by Death & Co. can be awfully obscure. I found a nice article on a tasting of 18 blanco tequilas, and since you’ve heard me complain before about the antiquated liquor laws in North Carolina (where I live) I won’t whine here, but I was finally able to find number 8 on the list, Herradura Silver. It’s a really nice tequila and I look forward to using it in other drinks, although I must say I want some Calavera Blanco if just for the bottle.